Connect your stack to machines and peripherals using RS-232 serial communications. Set the baud rate (speed) using the u_baud property for the RS-232 block in Stackbuilder. The connector is a DB-9 male. To set properties in Stackbuilder: Select the RS-232 block by clicking on it once. Click in the “Property Editor” in the bottom right, in the “Initial Value” column for the property you want to edit (if a character or string, use quotes). Version (F) (int): Firmware Versionu_baud (B) (int): Uart baud rate. default 9600 baud. u_enable (U) (int): Uart on 1 off 0. default is on. u_receive (C) (int): Uart. Terminal 1 output chars received or not. int. 1 on (default) 0 off. u_prepend (+) (Binary): Uart Bytes to prepend to all Uart strings sent to Terminal 1.
u_inttostr (I) (int): Uart Convert ints to string before sending out Uart. int 1 on 0 off. “Properties” – in (List or Property Name string): To set property. Send property name, Value. For example [’N’,’netname’]. “PResponse” – out (List or True) : On set, responds with True when done. On get, responds with list. For example [’N’, ‘netname’].”UART Send” – in (String, Binary, int): send string to UART, we only send valid ascii portion. Also accept binary raw bytes. Also int < 256. send out as raw byte. 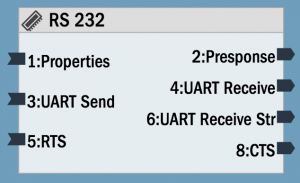 “UART Receive” – out (String): Single byte received by UART. sent as String. “UART Receive Str” – out (String): Ascii strings that are identified by a CR or LF or CRLF termination. “RTS” – in. (int or string) – Request to send. ‘1’ or ‘0’ string or int 1 or 0. ‘1’/1 is requesting to send makes the line low. “CTS” – out. Clear to send. Sends ‘1’ or ‘0’ string. ‘1’ clear. ‘0’ not clear.